Meiwa Co., Ltd. | Meiwa is a technology-oriented Japanese company aiming to achieve sustainable world by altering organic waste into valuables again, such as biochar for agricultural and energy use. Meiwa Co., Ltd. | Meiwa is a technology-oriented Japanese company aiming to achieve sustainable world by altering organic waste into valuables again, such as biochar for agricultural and energy use. We alter organic waste into charcoal by our biomass carbonization technology. Simply put, biomass carbonization plant is a waste recycling plant that can alter almost anything organic into charcoal (called biochar) through pyrolysis. Processable ingredients include sludge, human waste, chicken manure, scrap wood, agricultural residue, food waste and water hyacinth among others. As biochar can work as a natural fertilizer, soil conditioner, fuel etc., Meiwa’s biomass carbonization technology provides solutions to waste management and agriculture, environment and/or energy at the same time. We believe that technology should not be to destroy nature but should serve to make human society more natural and harmonious. Based on this philosophy, Meiwa Co., Ltd. aims to realize a more sustainable society by developing and disseminating numerous products. 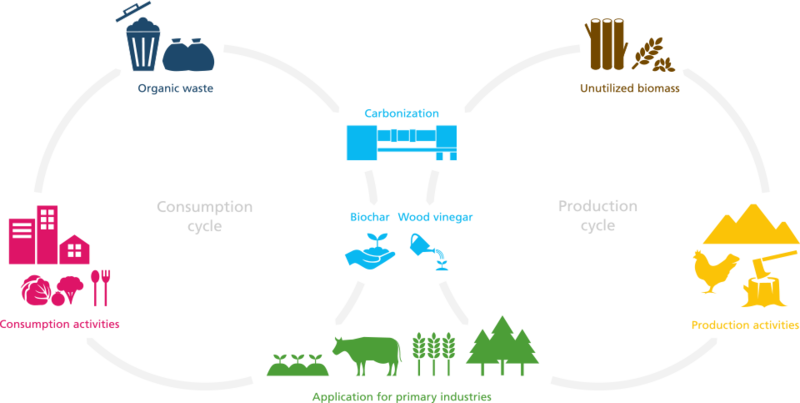 For example, organic waste and unutilized biomass generated in a way of consumption and production. These are valuable resources if you change viewpoints, and can be returned to something useful for agriculture and industry by carbonization, fermentation and gasification. We help you to recycle resources in your region by productive product / experience / technical knowledge in range from recycling by biomass carbonization equipment, biomass power generation equipment or methane fermentation equipment, etc. to environmental countermeasures such as dust collectors and wastewater treatment plants, production of charcoal fertilizer for primary industry and households, wood vinegar and compost base material. To live in a sustainable world with 7 billion people and more, it is essential to wisely use our natural resources and minimize the impact on the environment. Meiwa aspires to a leading for-profit company that grows by delivering various technological solutions for the environment, rather than exploiting it unsustainably. Because of the wide range of processable ingredients and application ways of biochar, our biomass carbonization technology can assist developing countries to achieve various development goals, ranging from climate change mitigation, waste management to Sustainable Development Goals (SDGs). Meiwa is a technology-oriented Japanese company established in 1964. As the leading manufacturing company, we have been developing various solutions to the environment and societies together with top research institutes and governmental organizations ranging from Tokyo University to Ministry of Environment. We aim to achieve sustainable world both in and out of Japan by our biomass carbonization plants and other environmental technologies.